As Klimek points out, pop culture hasn’t totally lost its yuletide way; in fact, some of the season’s best efforts are being written not by musicians, but by comedians. Take, as Klimek does, Stephen Colbert’s swinging “Another Christmas Song,” from 2008, an ostensible comment on holiday-music oversaturation that doubles as a how-to guide to cashing in on the genre. As it happens, the only original Christmas song to even gently shake the cultural firmament in the post-Mariah era was also written by funny men, but you can just as easily make the case for it as a pop anthem. 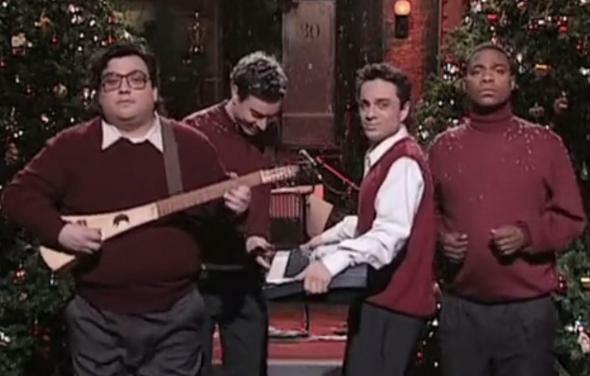 “I Wish It Was Christmas Today,” an original Saturday Night Live song that was first performed in a December 2000 skit by Horatio Sanz, Jimmy Fallon, Chris Kattan, and Tracy Morgan deserves a spot in the Christmas canon. What makes “I Wish It Was Christmas Today” so great? It is charming (someone is almost always giggling), gratifyingly lo-fi, performance art-like in the deliberateness of its nonsense, and ultimately true in its sentiment: We all wish it was Christmas today, don’t we? Most importantly, it’s an earworm with the bones of a fantastic pop song: An utterly rousing cover that the Strokes’ Julian Casablancas released in 2009 proves it. (It helps that Casablancas makes the song’s intentionally flat chorus soar.) By that point, Fallon had begun hosting NBC’s Late Night, and he resurrected the song that year with Sanz, Casablancas, and the Roots. Then he brought it back again—with Sanz, Kattan, and Morgan in tow—when he hosted SNL in 2011. Is “I Wish It Was Christmas Today” a fledgling standard? The handful of online tributes to the song could qualify it as a cult gem, and fans have uploaded an impressive number of covers to YouTube. And after Fallon ascends to the Tonight Show chair next year, he could institute a new tradition: Just as his soon-to-be-competitor David Letterman brings Darlene Love on The Late Show each year to sing “Christmas (Baby Please Come Home),” Fallon should book Sanz, Kattan, and Morgan every December for a new rendition of their own, underloved Christmas classic. Just one request: Keep the dinosaur noises.